Want to code web pages, but can't afford BBEdit or Dreamweaver? Want to code web pages, but can't afford BBEdit, Dreamweaver or GoLive? Then PageSpinner is a good alternative. 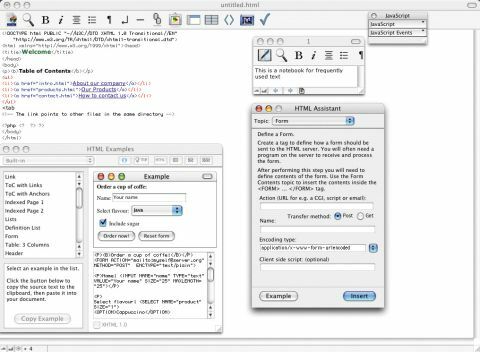 A text editor with source code highlighting, it also has many HTML-specific features, giving it a slight edge over BBEdit in some areas. As with most of the programs in our Group Test, you start by picking a template. These are really just HTML frameworks, rather than fully-fledged artistic masterpieces, containing the necessary code for, say, a threeframe layout or a table of contents. You then add code to build up the rest of the page from this initial skeleton. Unlike BBEdit, it doesn't assume you know everything about HTML already: there are numerous examples and online references to explain how coding works. PageSpinner doesn't stop with HTML. It supports PHP, SSI and CSS development, with shortcuts to various common coding requirements linked in. There's also a built-in FTP client. Compared with iWeb and RapidWeaver, PageSpinner feels unpolished and ugly. Its templates aren't going to help you develop an attractive website from scratch, unless you're extremely adept at web development.